I am waiting to see if some of my urban sketches got selected for the Foodways exhibit at the Minneapolis College of Art and Design. I did three sketches in April, focused on food and culture, and decided to share them online this week. One of the sketches is the one above, of the restaurant FIKA. This restaurant is at the American Swedish Institute in Minneapolis, and because I married into a Scandinavian family, I have been inundated over the years with all things Scandinavian. Which means some trips to the ASI (which is a really cool place). 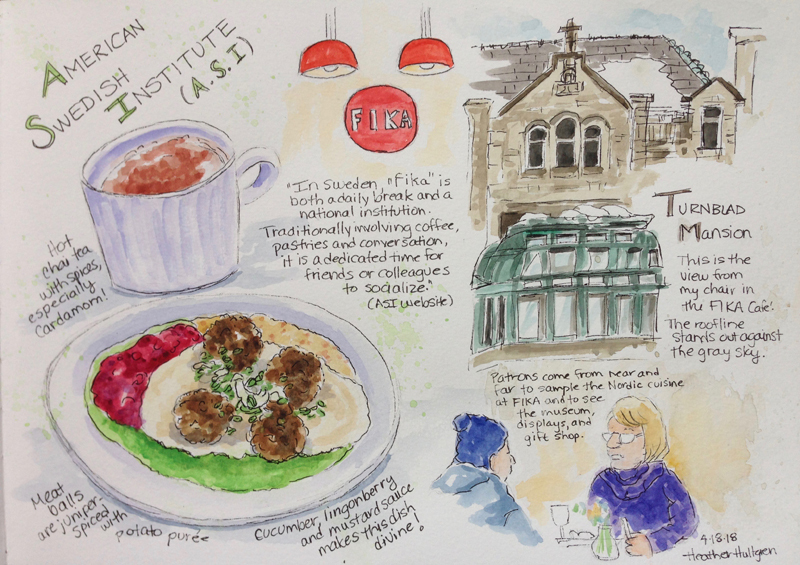 I went to the ASI on a cold blustery day with one intent: to SKETCH, then EAT the meatballs. I love looking out the floor-to-ceiling windows of FIKA (which is a word to describe a daily break in Sweden, which usually involves coffee, pastries, and conversation). I can see the Turnblad Mansion and admire its architecture. I had a fabulous cup of chai tea with lots of cardamom and the meatballs were divine, the best I’ve tasted. They were with a potato puree, cucumber sauce, and lingonberries, and the flavors swirled around in my mouth. I love those meatballs and could eat them anytime! Sketching food and culture is so much fun. Stay tuned for more to come!